Glide easily in and out of the water in just seconds without scratching your craft’s hull. Lightweight, portable and economical, the PWC Roll-n-Go makes getting on and off the water part of the fun! At just 54 lbs., this is Roll-n-Go’s most popular and most portable model. 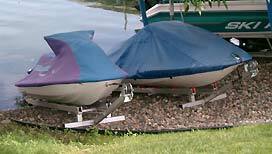 Adjustable rail spacing will handle any PWC, including all 3-person models. It has an overall length of 11 feet with extra optional 8 ft.-long sections available. The 15 foot winch strap includes a nylon loop on the hook to prevent scratching PWC hardware and hull. MAX. WEIGHT CAPACITY 1,000 lbs .